A sphere with a radius of 5 units has a volume of 523.599 cubed units. 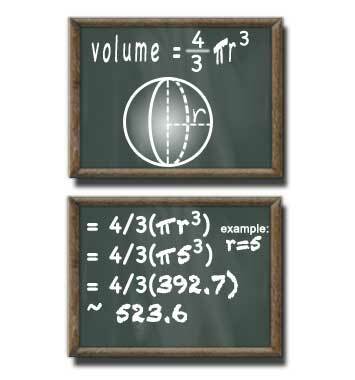 In plain english the volume of a sphere can be calculated by taking four-thirds of the product of radius (r) cubed and PI. You can approximated PI using: 3.14159. If the number you are given for the radius does not have a lot of digits you may use a shorter approximation. If the radius you are given has a lot of digits then you may need to use a longer approximation. Here is a step-by-step case that illustrates how to find the volume of a sphere with a radius of 5 meters. We'll use 3.14 to approximate PI because the radius we're given only has one digit.